Professional 18 oz. 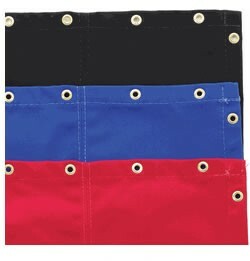 heavy duty canvas is manufactured for long, durable wear and lightning quick action. Reinforced brass grommets every 12" provide extra secure tie-down results. Seams are triple stitched with flat under seams for flat, smooth, wrinkle-free action. Comes complete with nylon tie-down cord. Also available in custom sizes. Colors: White, Blue, Red, Black, Grey Sizes: 12', 14', 16', 18', 20', 22', 24' (Custom Sizes Available Upon Request) We are the Custom Ring canvas specialists! Call for info 1(877)7BOXING or E-mail us for more information.